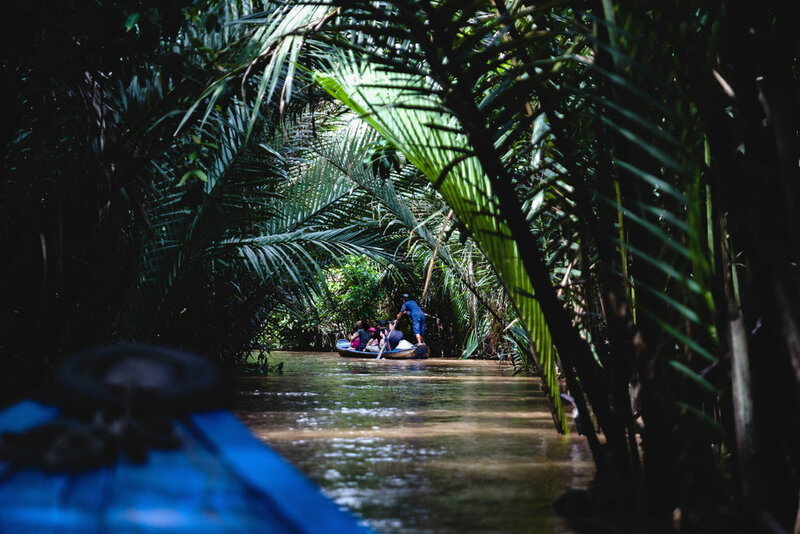 You’ll see completely different lifestyles from Ho Chi Minh and Hanoi venturing along the Mekong River for a day. We booked a tour through The Sinh Tourist, a well known tour provider in Vietnam. They ask you to check in the day before the tour which isn’t difficult since they have a convenient Ho Chi Minh location that is centrally located. It’s also the meeting place to embark on the tour. The Mekong river is the 12th longest river in the world and goes through several countries, so we really were only able to see a tiny portion of it. The start of the tour is a couple hours outside the city by tour bus. After arriving, we boarded a boat with our group that served as our main transportation for the day. The first thing immediately noticeable is how murky brown the river is. This is apparently due to the abundance of minerals in the water rather it being dirty, as we were told. We made our way down the river, which is pretty wide, passing traps in the water and locals fishing from their boats. The Mekong river is central to many people's lives. Visiting a rice paper maker was the first stop. While many of the ones we see in stores are more likely to be machine made, the people we saw were doing it completely by hand. Made like a crepe, the wrap is then laid on screens to dry out in the sun. A woman making rice paper by hand. Lunch was held at an open dining area nearby where we shared tables and local dishes with other group members. After our meal, it was back on the boat and up a narrower alleyway. Getting into buggies pulled by some small horses, we rode through a small town. It was a bit sad as the horses seemed exhausted and were being constantly hit with a small, cord-type of whip. We rode from several minutes, got off and made our way to a little gathering area where we ate some fruit while watching a local music performance. Jumping into small wooden boats, we all made our way through a narrow waterway under a tunnel of vegetation back to our tour boat. Each of the little boats were captained by a local that rowed us for half the journey and switched on the motor for the last half. The final stop was at a local candy maker. We watched them turning an off-white liquid into a candy that I'd describe as like a coconut taffy. Poured into rows, they were dried, cut and then individually wrapped. Our river tour came to an end when our bus dropped us back off at the departure point near The Sinh Tourist's main office location. We got back in the late afternoon, leaving the rest of the night to explore the bustling city of Ho Chi Minh.